The speech has yet to be officially announced, but expectations are already rising. Japanese Prime Minister Shinzo Abe has been formally invited to address a joint session of Congress when he travels to Washington DC this April, AFP reports. Abe’s speech to Congress has been in the works for some time; the official announcement is expected to be made soon. Abe will become the first Japanese prime minister to ever address both houses of the U.S. Congress, and the first to address any part of Congress in over 50 years. Then-Prime Minister Hayato Ikeda addressed the House of Representatives on June 22, 1961. Abe’s grandfather, Nobusuke Kishi, also addressed the House in 1957, during his term as prime minister. Abe’s speech is likely to be forward-looking, focusing on U.S.-Japan security relations as well as their economic ties — especially the effort to finalize the Trans-Pacific Partnership (which faces a stumbling block in Congress unless the legislature votes to give Obama Trade Promotion Authority). However, given that this year marks the 70th anniversary of the end of World War II, discussion is already turning to how Abe will incorporate history into his remarks. We want Congress to only extend the invitation to Prime Minister Abe to speak at the podium of Roosevelt and Churchill if they are assured that he will acknowledge that Japan’s defeat released the country from the venom of fascism and the inhuman goals of a criminal regime. Thompson also expressed concern that Abe is limiting a program that allows former U.S. prisoners of war to return to the sites in Japan where they were held captive. Foreign governments have also raised their expectations for the speech, with South Korea’s foreign ministry calling for Abe to “show sincere repentance for the past” in his speech before Congress. Still, the speech before U.S. Congress is unlikely to delve deeply into these historical issues, for the simple reason that Congress today is far more concerned with the present situation – and particularly worried about a growing threat from China. For example, a bipartisan letter sent this week from the heads of the House and Senate foreign affairs committees urged the State Department and the Pentagon to develop “a formal policy and clearly articulated strategy to address … Chinese coercion” in the East and South China Seas. “[T]he United States must work together with like-minded partners and allies to develop and employ a strategy that aims to shape China’s coercive peacetime behavior,” the letter argued. Thus Congress will be more concerned about tightening its partnership with Japan to deter China than about parsing Abe’s comments on World War II. In crafting his speech before Congress, then, Abe will have to decide who the primary audience is — the international community at large, or the United States specifically. The intended audience will determine the contents of the speech. 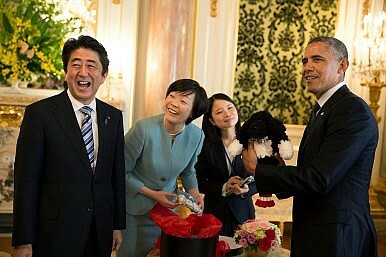 The Japanese prime minster's anticipated speech to a joint session of the U.S. Congress.